The System immunization helps you to prevent your computer from being infected by protecting the registry and file system most vunlnerable areas from changes. It doesn't use any resources and only takes a few seconds to be configured. UVK 6.8+ also includes a new feature: Execute prevent. This feature provides you with a new level of protection against viruses. It works by adding a few Software restriction policies directly to the Windows registry. On their turn, these policies prevent running files in specific directories, and optionally their sub directories. You can also backup and restore your registry in the System immunization section. The System immunization doesn't replace an anti-virus software, but it's a fine lightwheith complement, compatible with any other malware protection software. The System immunization can prevent some genuine programs and Windows updates from being installed/uninstalled. This may happen only for the areas not marked as Recommnded. If you get access denied errors when installing trustful software after immunizing your system, try temporarily removing the System immunization. You have many reasons to use the System immunization. Below are the main ones. If you get infected with a very recent malware and your anti-virus software doesn't detect it yet, your computer will still be protected against the most common infections. The System immunization doesn't use any resources and doesn't generate false positives. Not only does the System immunization protect your computer from infections, but it also prevents unwanted software such as Browser toolbars and other ad-ons from being installed. The System immunization helps to keep the good performance of your computer by preventing programs from being added to the windows startup, which will use resources continuously. You can select the areas to be immunized. You can quickly un-immunize (restore access to) one, several or all the areas you have previously immunized. 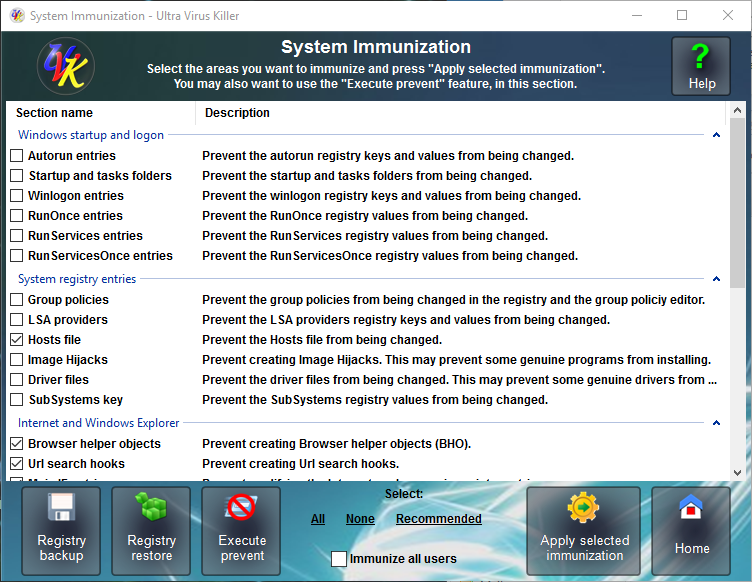 The System immunization protects your windows settings from being changed by malware, common software or un-experienced users by preventing the group policies, desktop and Windows explorer registry entries from being changed. The System immunization can protect your driver files from being replaced by rootkits. UVK uses a special method to make as dificult as posible for malware and non administrator users to restore the access to modifying the immunized ares. Select ( ) the areas you want to immunize by ticking the corresponding checkbox. To quickly select the recommended areas above, press Recommended, in the lower pane. You can also press All or None to quickly select all the areas, or none, respectively. Autorun entries (user choice) - These are the most commonly used registry entries to set programs to be run on the Windows startup and user logon. You can quickly un-immunize this area to allow a new program to be added to the list, and then immunize it again. While this area is immunized, no programs can be added or removed. Startup and tasks folders (user choice) - These two folders are used to run programs either at windows startup (startup folder) or at a specific time or date (tasks folder). While this area is immunized no files can be added or deleted in these folders. Winlogon entries (user choice) - This is a very vulnerable area to infections. Malware often use it to replace the windows shell application (explorer.exe) and the userinit application (userinit.exe) with their infected files. Un-imunize this area only if you're installing a trusted application to replace the windows shell, and immunize it again afterwards. RunOnce entries (user choice) - While this area is often used by malware to run their files once after reboot, it is also used by common software to complete install or uninstall on reboot. From a security view, it may be helpful to immunize this area, but you sould think of un-immunize it if you install or uninstall software that may need to delete or modify files on reboot. The system will still have access to modify these entries even when they are immunized. RunServices entries (user choice) - This area is no longer used by modern applications. But malware can still use it to run their infected services once upon reboot. RunServicesOnce entries (user choice) - While some legacy applications may use this area to run their services once after reboot, it can also be used by malware to do the same thing. Group policies (user choice) - UVK will prevent the group poilicies from being changed either using gpedit.exe or modifying the corresponding registry entries. Un-immunize this area only if you want to modify the group policies yourself. Lsa providers (user choice) - This area is oftenly used by malware to infect the Windows security providers. Hosts file (recommended) - The hosts file is very oftenly used by malware to create internet redirects and prevent access to Microsoft and Anti-virus websites. Immunizing this area will protect the hosts file from being modified. Image Hijacks (user choice) - Another very vulnerable area which is used by malware to run infected files instead of system files. Driver files (user choice) - Some viruses replace the driver files with rootkits. Immunizing this area will prevent the driver files from being modified or deleted. However, you will probably have to un-immunize this area to update non windows drivers. SubSystems key (user choice) - Prevent the values under the HKLM\SYSTEM\CurrentControlSet\Control\Session Manager\SubSystems registry key from being changed. These values are commonly used by modern malware to load their infected dll files. Browser helper objects (recommended) - Prevent Internet explorer BHO registry keys from being modified. This will prevent adding toolbars and ad-ons to Internet explorer. Url search hooks (recommended) - Prevent the Url search hooks registry keys from being modified. IE main entries (recommended) - Prevent changes to the Internet explorer main registry keys. This will prevent modifying the Internet explorer welcome pages and other settings. IE toolbars and search providers (recommended) - Prevent adding toolbars and search providers to Intenet explorer. Internet settings (recommended) - Prevent changes to the internet settings. Explorer registry entries (user choice) - Prevent modifying the Windows explorer settings. You must un-immunize this area to be able to change Windows explorer settings such as the folder view, or displaying the hidden files and folders. Shell execute hooks (recommended) - Prevent the Windows explorer Shell execute hooks registry keys from being modified. Desktop registry entries (recommended) - Prevent the Desktop registry keys from being modified. Start menu (user choice) - Prevent the Start menu from being deleted. Programs will still be able to create new files and folders in the start menu, but they will not be allowed to delete the existing ones. Preferences (recommended) - Prevent the Google Chrome's preferences from being changed. Secure preferences (recommended) - Prevent the Google Chrome's secure preferences from being changed. Extensions (recommended) - Prevent adding or removing extensions to Chrome. Chrome's Group Policies (recommended) - Prevent changing Chrome's Group Policies. Ad-Ons (recommended) - Prevent changing Mozilla Firefox's ad-ons. Extensions (recommended) - Prevent changing Mozilla Firefox's extensions. Search providers (recommended) - Prevent changing Mozilla Firefox's search providers. Settings (recommended) - Prevent changing Mozilla Firefox's settings. When you have configured the areas you wish to immunize/un-immunize, click Apply selected immunization, and confirm to start the immunization. It will only take a few seconds to immunize all the areas, it's a very fast process. Note: UVK will automatically un-immunize the un-checked areas, if they have been previously immunized. And that's it! When you come back to this section again, the immunized areas will automatically be selected. If you wish to un-immunize one or several specific areas, just uncheck the corresponding checkboxes and click Apply selected immunization again. The users who have purchased a UVK license key will also be able to choose whether to immunize the registry keys and folders for all the users or just the current user. For more information about the UVK license key, click here. This section also allows you to make a backup of your windows registry, which you can restore later if your system gets damaged. Note that the Restore registry option will be disabled while you don't make your first registry backup. To backup the registry, just click Backup registry and confirm by clicking Yes. To restore a previous registry backup, click Restore registry, choose if you want to restore the HKEY_LOCAL_MACHINE or the HKEY_CURRENT_USER, or Both rootkeys, and click OK. UVK will then start restoring your registry. Usually it takes a few minutes to restore the both rootkeys. To return to the main menu, click Home.